Buy direct from a PA producer. For those that live in Pennsylvania and New York you can buy directly from us. The best and most economical way is for you to pickup your purchase right here so you can see exactly how we raise and process your food. We like to be customer inspected! We can deliver to drop points in PA and those in NY near the PA border can pick up our products at our place or a drop point in PA (we can’t take our products across the state line but you can). If you don’t live near us and can’t find a local supplier go to our page on where to buy grass fed meat and I will show you a few hand picked online companies that offer safe, high quality meat such as beef, chicken, pork, and seafood at a reasonable price. Order your beef by mid April to reserve it for the fall harvest. We sell beef by the whole, split half, and mixed quarters. This gives you the best assortment of cuts. Beef is sold by the hanging weight at $3.50 per pound and the butchering is usually around .80 – .90 cents per pound depending on what custom items you want done like bologna, minute steaks, or sausage. Whole beef will range from 500 to 600 pounds hanging weight and cost $2,100 to $2,600 on average. 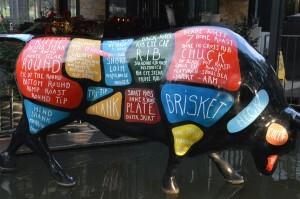 Half a beef will weigh 250 to 300 pounds and cost $1,050 to $1,300 on average. Quarter beef will weigh from 125 to 150 pounds and cost $525 to $650 on average. Down payment on beef orders. We ask that you give us a down payment on beef orders to help us carry the cost of raising them through the growing season. A down payment secures the order for you and helps spread the cost out so you don’t have one big bill in the fall. We will show you what a down payment on a order would look like depending on the amount of beef you want. whole beef would be $1000 deposit. Keep in mind that many factors contribute to the size of the animal from year to year like rainfall and seasonal temperatures such as a cool wet summer vs. a hot dry summer. Hanging weight vs. take home weight. This is something many folks get surprised by if they are buying their meat “by the animal” for the first time. The processor/butcher bases everything on hanging weight which is the weight of the carcass after the innards, head, legs, and hide are removed. As the butcher cuts the carcass into your desired cuts such as steaks, roasts, and ground meat they trim away things like bone, some fat, gristle and other parts that don’t need to be in your meat. This is known as offal and you don’t take this home with you unless you request more things like soup bone or tallow/fat. The take home weight is often 60 -70% of the hanging weight. Example: Half a beef at 300 pounds hanging weight may give you 210 pounds of meat to take home. This makes a difference on the total cost per pound of your meat. If you are paying $4.40 a pound hanging weight for the animal and processing your take home cost per pound will look more like $6.28 a pound. This is still a great deal for the quality of the meat you are getting but it is something that catches people off guard sometimes and don’t be afraid to ask us about this if it doesn’t seem clear to you. Keep in mind you are stocking your freezer with all natural premium steaks and roasts for 6.20 per pound. That is less than half the cost of an organic certified steak in the store, and the best part is you know where it came from. 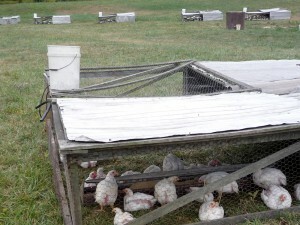 We raise pastured non GMO meat chickens from May to October. The chickens weigh from 4 to 8 pounds with an average weight of around 6 pounds. You can request smaller (4-5 lb) or larger birds (6-8 lb) depending on your needs. Weather factors can determine availability of certain sizes. Price is $3.50 a pound. You can order chickens throughout the growing season to eat fresh or stock your freezer for the winter months. The earlier in the season you order the better likelihood we will have enough to fill your order. We offer fresh unfrozen turkeys for your Thanksgiving holiday meal or you can freeze them to enjoy latter. Orders should be placed by mid July with a $20.00 deposit to secure your order. Turkeys are processed the week before Thanksgiving and you will be notified of the date and time to pick up your bird. Email your requests to jason@amazingcreator.com and we will get back to you about your order. We are interested in a half beef share as well as a few chickens. We are in Putnam County New York, however we have family in Easton and Hatboro PA and could pick up there. If this feasible with your company? I will email you with some details and we can see what works for you. Thanks for checking us out! do you have the ability to ship orders? We don’t ship outside of PA since we are not USDA inspected. We encourage our customers to come to us and pick up their orders so they see first hand how their food is grown. If that doesn’t work for you I would recommend you check out the Butcher box link found on our website. Let me know if you have any other questions. I have both cirrhosis from an unknown cause and because of this I now have Chronic Kidney Disease. I am on a very strict diet. Low sodium, potassium, phosphorous in addition to limited fluids and 60 Gm of protein . I have been studying about chicken and was horrified to find that many are infused with”natural” broth which is loaded with sodium, potassium and phoshorous. Also very discouraged to hear how they are raised. I am supposed to eat mostly chicken, turkey, and fish. I thought I was doing well but my situation is declining and I am now on a liver transplant list. I can have some red meat but just not a lot. Where exactly are you located and is there a place close to Lancaster, pa that we could pick up. I am a Christian for many years now and I am very impressed with what you believe to be the best way to raise beef and chicken. Do you have roasters as well as chicken breasts etc. is it too late to order a turkey for Thanksgiving ? I have a freezer so I could buy a quarter of a beef if that is still available. I have very limited energy right now so though I might not be able to pick up the meat , my wonderful husband of 41 years could. I am anxious to see if better eating will improve my health. If nothing else at least I will know what I am eating. A risky business when buying in a grocery store and eating out. So sorry to hear of your health problems and I will be praying for you Cindy. Really glad you are doing your homework to find the truth about health and nutrition. It is so important to eat clean, safe, and nutrient dense foods. I will be glad to work with you and see what we can do to supply you with quality meat. The road to health and healing is one step at a time. Thanks for contacting us and God bless! I Am interested in purchasing some chickens from you. Sure, I will contact you and give you some details. Thanks for your interest in us. Hi Esther, We can do soy free chickens and I sent you some info in an email so I hope you got it. Let me know if that answers your questions and if we can help in any other way. Thanks! Interested in purchasing beef and chicken. Could you send me information? Hi Jason, I came across your website in my search for a beef and chicken provider. Could you send me some info on 1/4 beef and chickens? Thanks for contacting us about beef. I will get some info to you soon. Jason what is the closest drop point you can deliver to Plymouth Meeting, PA? We do have a drop point in the Scranton area. If we get enough interest in the Philly area we would consider a drop point in your area. I will email you more info soon. Thanks!